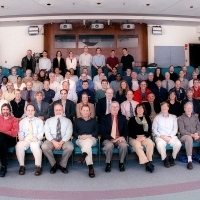 Several members of the New Horizons team gathered in November 2004 for this team photo at the Johns Hopkins University Applied Physics Laboratory (APL) in Laurel, Maryland, where the New Horizons spacecraft is being built. 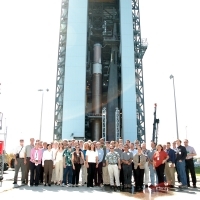 Principal Investigator Alan Stern, director of the Southwest Research Institute (SwRI) Space Studies Department, leads a mission team that includes APL, Ball Aerospace Corporation, the Boeing Company, NASA Goddard Space Flight Center, NASA Jet Propulsion Laboratory, Stanford University, KinetX, Inc., Lockheed Martin Corporation, University of Colorado, the U.S. Department of Energy, and a number of other firms, NASA centers and university partners. 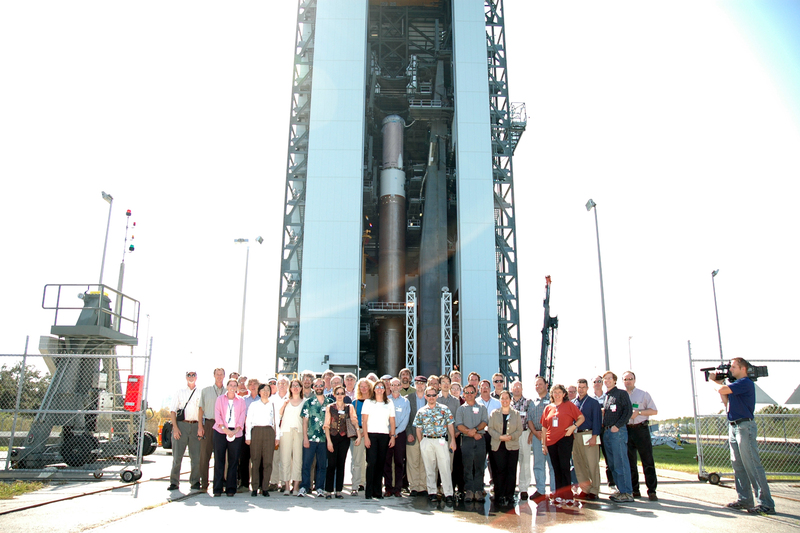 During the November 2005 Science Team Meeting at Kennedy Space Center, team members had an opportunity to see the New Horizons Spacecraft and the Atlas V.